BOSTON, Feb. 6, 2019 /PRNewswire/ -- President John F. Kennedy established a vision of technical achievement and jump started decades of scientific advancement unprecedented in our nation's history with these words. To celebrate the 50th anniversary of the Apollo 11 moon landing, the John F. Kennedy Library Foundation today announced that Raytheon (NYSE: RTN) has provided $1.5 million for educational initiatives. 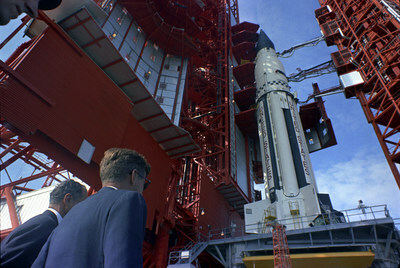 President John F. Kennedy's vision challenged the nation to land a man on the moon before the end of the 1960s. This inspired one of the greatest mobilizations of resources and manpower in U.S. history. Just eight years after his directive, on July 20, 1969, astronauts Neil Armstrong and Buzz Aldrin took the first steps on the moon. This stunning achievement inspired American innovation and prestige, both at home and abroad. "President Kennedy's commitment to harnessing science in pursuit of a common goal inspired a generation to reach for the moon, and it continues to inspire today as we take on new challenges," said Steven Rothstein, executive director of the John F. Kennedy Library Foundation. "We are grateful to Raytheon for their generous support, and we could not have asked for a better partner to help us celebrate the 50th anniversary of Apollo 11, President Kennedy's legacy of bold leadership, and the new frontiers of innovation we are experiencing today." "The Apollo program sparked the scientific achievement of a generation to explore and transform science, technology and education," said Thomas A. Kennedy, Raytheon Chairman and CEO. "As we challenge ourselves to drive critical advances in technology every day, we are excited to amplify JFK's enthusiasm for transformative technology to stimulate a new generation of moonshot thinkers." AUGMENTED REALITY: The experience, created by global marketing and technology agency Digitas, will allow people to immerse themselves in the Apollo 11 mission from anywhere in the world. The experience will be anchored by a virtual replica of the Saturn V rocket on Library grounds in Boston. People around the globe will be able to follow the Apollo 11 launch and lunar landing through a downloadable app that includes game features allowing users to engage in their own "missions." JFK SPACE LABS: Working with the International Space Station National Lab, to implement JFK Space Labs in selected schools and afterschool programs nationwide. Middle and high school students will use the labs to conduct experiments similar to those taking place on the International Space Station and then compare their results with scientists in space. SPACE DAY: On July 20, the 50th anniversary of the Apollo 11 lunar landing, the JFK Library will offer a series of on-site commemorative events and activities and will align with locations across the nation on regional and virtual celebrations. FORUM SERIES: The Kennedy Library Forum series will highlight the importance of Apollo 11 and President Kennedy's impact on the mission and NASA overall. Forum speakers include award-winning author and historian Douglas Brinkley, who will discuss his forthcoming book American Moonshot: John F. Kennedy and the Great Space Race, and Apollo 11 Command Module Pilot Michael Collins. COLLEGE SYMPOSIA: NASA personnel to be featured speakers at select universities nationwide to collaborate with technology and engineering students on the thinking that is driving the technology innovation of the future. "Here at the Kennedy Library, we house the historical evidence of the words and actions that fueled the mission to successfully land on the moon," said Alan Price, Director of the John F. Kennedy Presidential Library. "We look forward to working with the JFK Library Foundation and Raytheon to inspire new generations with the grand vision, hard science, engineering, poetry and power that characterized so much of the Kennedy Presidency and led to one of the greatest achievements in human history." Visit www.jfklibrary.org for the latest announcements and calendar of events.